While architect Frederick Vincent Lockman was born in Milwaukee, Wisconsin (September 13, 1896) he grew up in Seattle, graduating from Lincoln High School in 1915. Upon graduation, he attended the University of Washington where he received a bachelor’s degree in architecture in 1920. He then went to work for architect Harlan Thomas (1920-21); and had a short stint with the Metropolitan Building Co. (1921) before opened his own firm in 1925. It was during this time that he acquired his State architectural license on August 10, 1922 (no. TL9). 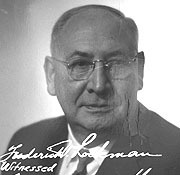 Within four months of opening his own firm, Lockman formed a partnership with Otis E. Hancock (1925-33). Known projects by the firm of Hanock & Lockman are limited to the Barnum & Lemcke Building in Ballard (1927). Projects were scare during the Depression years, so Lockman took a job as an assistant architect for the US Bonneville Power Administration in Portland (1939-40). He then went to work for US Army Corps of Engineers, Seattle District, rising to the title of Chief of the Design Section & Engineering Branch of Alaska operations (1941-45). After the end of WWII, Lockman returned to private practice (1945 to 1970). He specialized in ecclesiastical designs, and was often brought in as a consultant on various religious projects across the state. He was an active member of the Church Architectural Guild of America. His designs include Queen Anne Baptist Church (1925-1936) and University Baptist Church – Navy Unit (1938) both in Seattle; Stuart Memorial Chapel (1937) in Carnation, First Baptist Church (1941) in Puyallup; First Baptist Church (1939) in Port Angeles. Some of his last projects included additions to the Acacia Mausoleum in Lake Forest Park in 1962 and 1971. Joint projects in which he served as a consultant include Beacon Lutheran Church (1947 with Ayer & Lamping), Haller Lake Methodist Church (1949 with Ayer & Lamping); Mount Olive Lutheran Church (1947 with Ayer & Lamping); West Side Presbyterian Church (1946, 58 with Otis Hancock); and the First Congregational Church (1955, with John Villesvik) in Yakima. During his career, Lockman was very active in the state and local chapters of the AIA. He served as State AIA director (1927-1930); was on the Seattle AIA Medical Facilities Committee (1957-59); and acted as Chairman of the Seattle AIA chapter Education Committee (1960-61). He was also a member of the planning board for Fort Lewis and Fairchild AFB and acted as the chief negotiator for architect-engineer contracts for the US Army Engineering District Seattle. Lockman passed away in Seattle on October 27, 1984. "Mausoleum Completed" Seattle Times: November 4, 1962. "Addition to Acacia" Seattle Times: January 3, 1971.